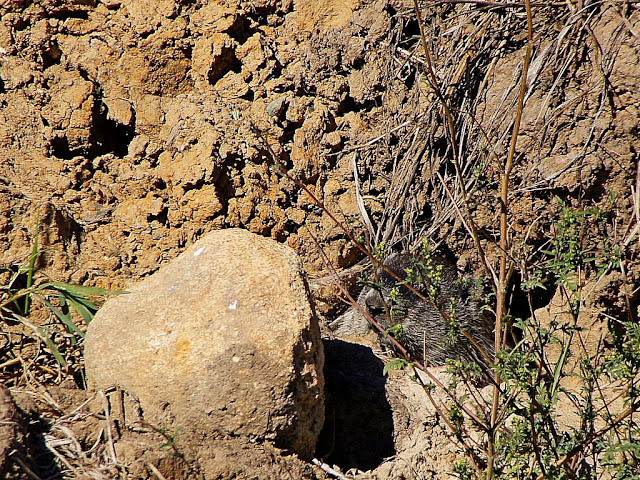 Can you see the critter? I found his nose first! He blends in well with his surroundings...cute!!! Thanks for hosting and Happy Critter Day! Funny, how cute! I see his little face peeking out. great shot! Oh what a lovely shot, and he really thinks he is not seen! awwwwwww, great camouflage!! Totally mother nature at its finest. Excellent. Funny picture - the animal has sure left its "cave" / grave. I can see it - but don't know what it is. Took me a little while but I got there in the end. great camouflage. You must have great eyesight Misty. I found him in the end. I see a little furry face! Ohhh I see something hiding in there. Pefect photo! I can spot it. Wonderful capture. Nope...no critter there...none that I see! 8v) Nice shot of a stone. Wow! I can only barely make out a nose and what look like bristles, but have no idea what s/he is. Hedgehog, maybe? Amazing that you saw him/her and got the capture too. Great shot! I can see it but I am not sure what it is. A fox? Cute little groundhog...thinks no one can see him! Fantastic photo, Misty. I was all ready to think this was a "gotcha" when I finally spotted this cute critter!